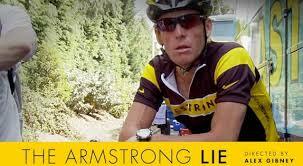 We should all consider ourselves lucky, with the exception of Lance Armstrong. We as an audience are fortunate that Academy Award winning documentarian, Alex Gibney (Enron: The Smartest Guys in the Room and Catching Hell) was amidst a superfluous fluff doc about the infamous and storied cyclist’s 2009 return when it all hit the fan. What was set out to be one story had to be twisted into another and while Lance is a liar and a cheat, the man has big ball (maybe cheap, but not a typo) and allowed the director one last interview so that the film might be salvaged. Credit should be given to the defamed cyclist for not only allowing, but aiding this once misguided documentary to come to light and fruition. Not being a fan of the sport I did find myself lost on more than one occasion, but what is presented in this character study is riveting. The full spectrum of emotions from anger and hate to sadness and empathy are evoked during the, albeit too long 122 minute documentary. No need to see this on the big screen necessarily, however the POV footage of crazy cyclist fans running along side the exhausted competitors is almost worth it. Posted on Monday, November 25th, 2013 at 4:06 am and is filed under Reviews.